Mudah.my is offering users a fun twist to traditional fortune readings this Lunar New Year with its latest campaign centred around the message of “Let it Go, Let it Grow”. The digitally-driven campaign aims to encourage users to sell their items on the Mudah.my platform to make way for greater prosperity during the auspicious season. 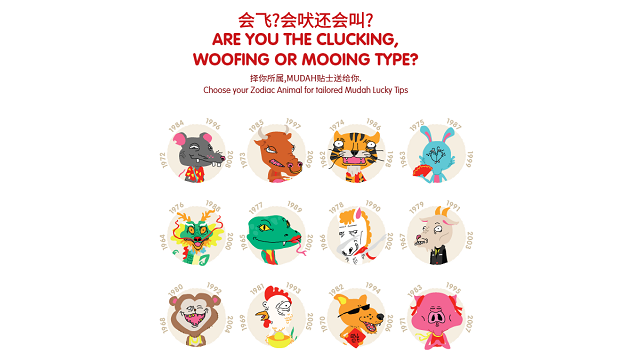 Inspired by the Chinese Zodiac, the brand is bringing their festive message to life through the creation of 12 fun, parody-like characters based on the renowned zodiac animals. The animated caricatures offer personalised counsel to users on what they can sell (“Seh”) and buy (“Tak”) on Mudah.my. The campaign launched on Mudah.my’s website, mobile app, and social platforms, and will kickstart with a six-second teaser video amplified on social media. Through the video, viewers are then directed to the campaign microsite, where they can access their virtual, personalised tellers. To supplement this, Mudah.my is also partaking in the spirit of giving by incorporating a giveaway segment before unveiling its custom “fortune advice” to visitors. In addition to this, the online marketplace is also integrating WhatsApp and Facebook into its interactive microsite to allow viewers to share the results of their “Seh Tak” reading with their friends and family. The campaign will run for the duration of the Lunar New Year period. Gaurav Bhasin, CEO, Mudah.my said it wanted to engage consumers with a message that resonated with them alongside the celebrations. “We have always championed the spirit of letting go and decluttering in our previous campaigns – this year, our message is no different, as we hope for an auspicious and stressfree new year ahead for our users,” he said. Meanwhile, Mudah.my’s head of marketing, Andrew Pinto, said the company wanted to play a more interactive role in consumers’ journey in selling and purchasing items online. “In tapping into our users’ cultural nuances, we wanted to create a campaign that not only celebrated the essence of the season, but could also provide actionable results for both the company and its customers. Hence, the idea of creating Zodiac Animals for 2019 fortune came to life,” Pinto said. This is to establish a deeper footprint in the Asia Pacific region as well as to increase its scale to compete with larger global ..